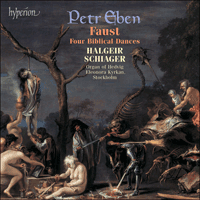 Petr Eben was commissioned to write the stage music for a production of Goethe's Faust for the anniversary of the Burgtheater in Vienna (the later version for the organ solo came about in 1980). For this work, he set himself the task of expressing the polarity of good and evil in one person, since he felt the idea behind Goethe's drama was not to create a play about God and Mephistopheles taking place around Faust, but rather to demonstrate the struggle of these conflicting elements within Faust's character. That is the reason why he also sought to realise musically both influences within the one instrument. Consequently, Eben gives the organ a dual role, adding to its venerable, traditional style, the trivial vulgarity of a barrel organ. Thus, the Faust cycle provides us with a glimpse into the eternal struggle within man's being. The rhythmic element of the organ has always inspired Eben, and in the Four Biblical Dances he chooses the rarely used genre of the dance. The organ as a church instrument led him to keep its sacred characteristics so Eben therefore chose dances which appear in the Bible.